Birdhouses for Birds – Nestbox, from the name itself, is a man-made box or enclosure that is used as a place for animals, such as specific mammals and birds, for nesting. Birdhouses for birds are different-sized nesting boxes typically made from wood, and sometimes metal. These boxes are built to look like small houses, and are made creatively using different colors and embellishments. These birdhouses are oftentimes found in gardens or outdoor spaces to attract and house different various types of birds. Aside from that, it can also be used as decorative pieces that add extra charm to any space. Strategically placed birdhouses can beautify various areas while giving birds a safe space to nest and interact with other species of their kind. It can also help maintain or increase the population of bird species in a certain area. Birdhouses can be made a different number of ways, depending on the kind of bird you’d like to attract. Below are the different birdhouses most suitable for cardinals, finches, and robins. Cardinals are oftentimes characterized by their bright red plumage. They are called as such because their color resembles the red robes donned by cardinals of the Catholic Church. They are considered one of the most desirable “backyard” birds, because of the beautiful songs they sing and their vibrant colors that never fade or change. These large birds are quite easy to attract as they do not migrate, and can be backyard visitors all-year-round, especially when you’ve got a reliable source of food, water, shelter and nesting areas available. To attract cardinals, one must know that they prefer shrubby areas and thick vegetation. They have strong and thick bills that are best for eating large seeds such as sunflower and safflower types. You can also attract them with cracked corn, peanuts, berries, and apple chunks placed in big and spacious feeders suitable for perching. Also, it is best to steer them clear from reflective surfaces, as they are pretty aggressive, and can get very territorial especially during breeding season to the point that they will even attack their reflections when they see it. Cardinals are not what you might consider cavity-nesters; they create open cup-sized nests made from various plant materials such as twigs, stems, bark strips and such. Since cardinals are large birds, enclosed birdhouses will not be suitable for them. They prefer open nesting areas that give them enough space to perch, build their nests, and freely move around. You can do this by creating nesting platforms instead. Nesting platforms are open on all sides, and is built with corner posts that allow roof support that can offer protection for the nesting cardinals. It is best to mount or position these platforms on the ground or near walls where there is thick plant cover and shrubbery. The ideal height of a wooden nesting platform, including the roof, would not exceed four feet from the ground up. It is important to place nesting platforms for cardinals near areas where they can gather suitable materials for creating their nests. Finches are one of the most common birds that you will see in your backyard. They are pretty sociable creatures that enjoy visiting well-stocked feeders and interacting with their kind. Also known as “house finches”, these small birds are just about the size of sparrows. Males are seen with red-orange chest marks, while females are usually plain and un-striped, with heavy streaks on the body. It is best to attract finches with plant food. They also enjoy eating some insects and feeding them to their young. Their natural diet, however, consists of fruit and weed seed. During winter, they get the seeds from winter berries. It is easy to attract finches with different types of food such as various birdseeds, fruits, crumbs, suet, and nectar to name a few. Just also make sure that you provide a clean source of water, as well as the most suitable nesting areas for them. 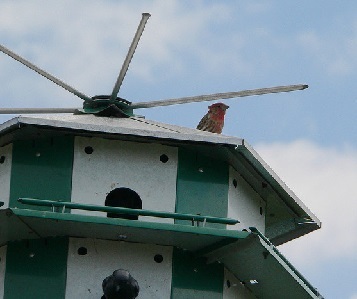 When it comes to housing, finches prefer open spaces compared to the regular enclosed birdhouse. They would much rather choose a nesting platform or basket-style shelter with an open top. In building a finch birdhouse, always remember that these creatures are quite small. The ideal dimensions for the birdhouse are as follows: 6 inches in width, 12.5 inches in height, and 8.5 inches deep. It should also have an opening that is 1.5 inches wide, plus a predator guard that will protect these birds from unwanted visitors. It is best to place these birdhouses or basket in a tree that’s at least 8 feet tall, giving the birds more space to enjoy around their nesting place. Robins are large songbirds that have round bodies as well as long legs and tails. These birds are the largest among North American thrushes. They are characterized by gray-brown plumage, with orange marks and dark-colored heads. But among males and females, the latter has a paler head compared to its counterpart. 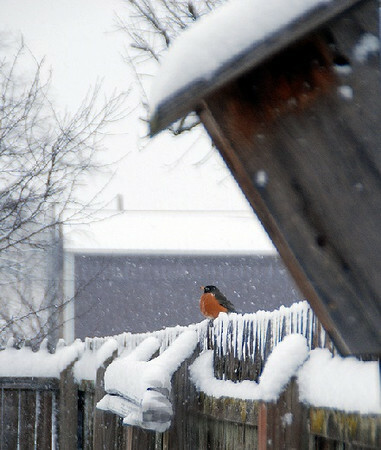 Just like cardinals, robins prefer open birdhouses. They are not cavity-nesters so they prefer a nesting shelf or platform that is either open an all sides or has a three-sided enclosure. It is important to mount these nesting shelves in a natural habitat that is abundant with trees and grass, that’s best for hunting earthworms. For robin birdhouses is it best to use dimensions measuring 6x6x8 inches. Make sure it has an open front, with the color of the house preferably in earth tone. When creating birdhouses, it is important to remember the most basic needs of birds. You must make sure that you know the behavior of the species you’d like to attract. Prepare as much food and water, and place your nesting shelves and birdhouses in the most strategic of places. This will vary depending on the type of bird you are trying to attract. 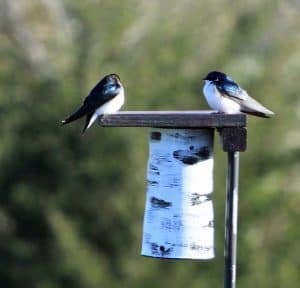 When building birdhouses for birds, it is best to use durable wood and corrosion-resistant screws, plates, and other materials as you will be placing these boxes outdoors, exposed to various elements and weather conditions. Also make sure that these birdhouses are well-made and will be able to protect birds from predators. Installing a predator guard is important as there are many other creatures lurking in forests and various natural habitats. I am so thankful for what you have shared about birdhouse ideas. There are two things here that caught my attention. First, it is when you said that they attract more birds. I agree with that, these birds may feel comfortable with these houses. And second, that the birdhouse must be put into as a high as 8 feet tall, so they’ll be more comfortable and can keep on coming back.